Strona główna › MOTOCYKLE UŻYWANE › 2016 Forty-Eight - 2017 BotK 1st place Winner! Today, Harley Davidson Łódź has a special offer. 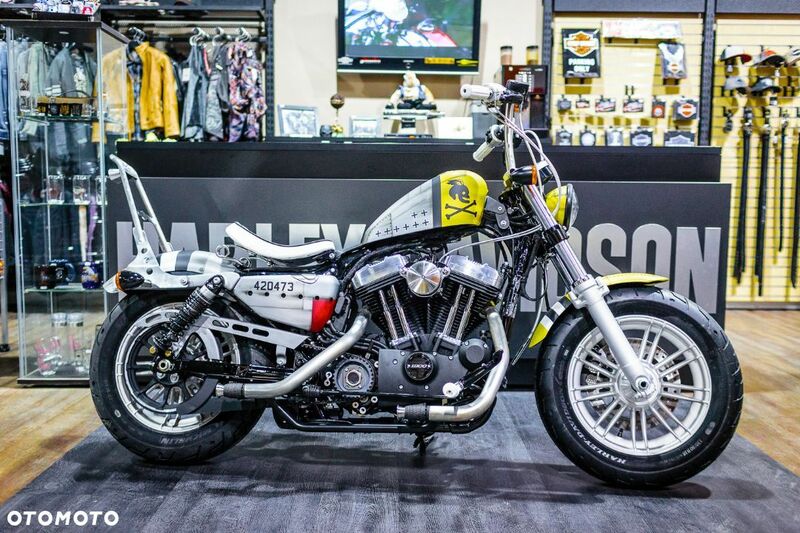 It is a Harley Davidson XL1200X Forty Eight hand build for a 2017 Battle Of The Kings competition, which he won in Central Eastern Europe region. Its has been built by our main mechanic and painted by professional colour shop. The main theme is taken from an aircraft which is a P-47 Thunderbolt - # 442 - wyświetl numer - . The plane which this bike is themed on was flown by Commander of 353rd Fighter Squadron in France, Maj. Glenn T. Eagleston. As we can see on the pictures the bike has kept its original structure but some of the parts are moved, hand made or special made. The break, clutch and throttle lines are braided. The exhaust is properly loud and the intake is also beautiful. If you have any questions do not hesitate to contact me. For Serious buyers the price is negotiable. refer to Bobber type motorcycles. more compact and the seat was at the desired height. with a design from the P-47 Thunderbolt.